American-built in 1997, Grande Caribe carries American officers and crew and up to 84 passengers. It's designed to reach bodies of water and ports that bigger vessels can't visit. The retractable pilothouse allows it to pass under low railroad bridges, and the shallow draft permits river and canal cruising and landing close to shore. The flat bottom may result in an uncomfortable motion if the seas or lakes are rough, though the majority of the itineraries are in protected waters. Other features include a bow ramp for beach landings, an underwater exploration camera and a swimming platform in the stern. Caribe has an informal, low-key atmosphere, where passengers get to know each other and make new friends. The single public observation lounge seats all passengers, and a one-seating dining room serves all meals. The food is tasty all-American fare, often reflecting the cruising region, and passengers may sit with whom they wish. Alcohol is not sold, but wine is offered on special occasions, and passengers are encouraged to bring aboard their own supply of alcoholic beverages. Soft drinks are complimentary. An open top deck has deck chair seating and affords decent sightseeing opportunities. The stairwell that connects the lounge and dining room decks is outfitted with a stair lift to assist passengers with mobility issues. The tiny cabins range from 72 to 96 square feet and are a mixture of inside and outside rooms in several different configurations. The least expensive cabins have no windows and a double bed (usually with a single bunk above). Outside cabins -- with portholes or windows that open -- may lead out to a central corridor or the open side promenade (for quick access to the scene outside). These cabins come in a variety of sleeping configurations: a single double bed, twin beds arranged side-by-side or at right angles to one another, or one upper and one lower berth. The ship is fully air-conditioned. Closet space is sufficient for what is an always-informal dress code. Some bathrooms have small single compartments for showers, sinks and toilets with an accordion-type door, while others have separate shower stalls and spaces with sinks and toilets. Organized activities and usual shipboard pastimes -- such as bingo, spas, shopping and major stage shows -- often found on big ships are absent. The emphasis is more on socializing, sightseeing and, depending on the itinerary, swimming, snorkeling, sunbathing and glass-bottom boat riding. Evening entertainment is usually a lecture, followed by cards, reading and videos. Local bands and entertainers come aboard in some ports. Shore excursions are extra and may be bought as an advance-purchase package or individually onboard. Grande Caribe was last refurbished in 2009. 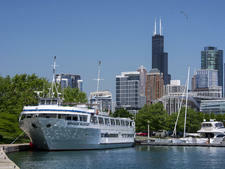 It sails Great Lakes, harbors and waterways in the summer and fall, from Chicago; New York (Manhattan); Boston; Rockland, Maine; and Warren, Rhode Island. American-built in 1998, Grande Mariner carries up to 83 passengers. Its informal, low-key atmosphere means cruisers get to know each other.